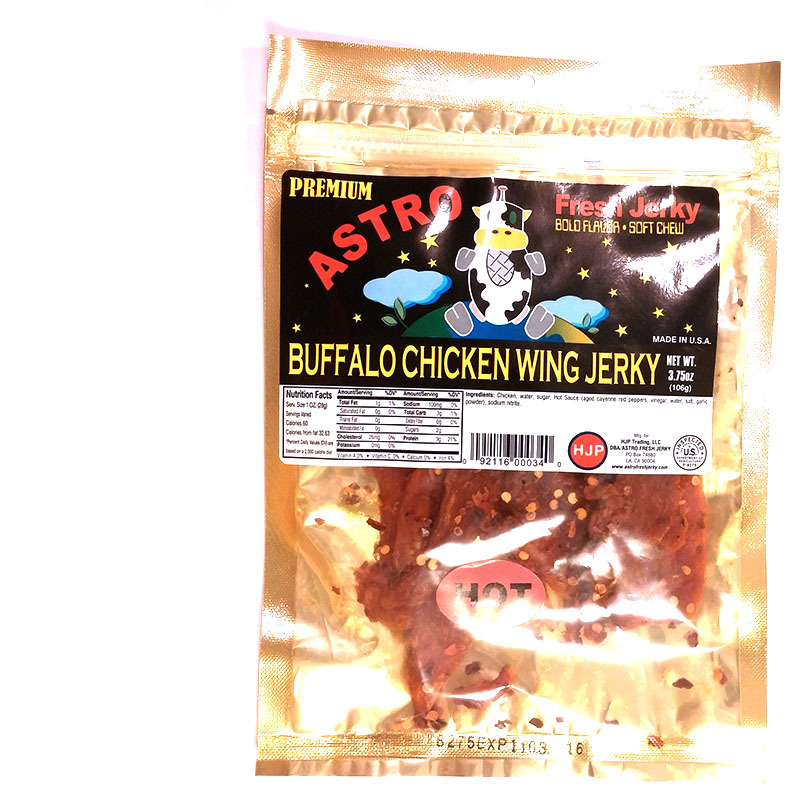 The first flavors that hit my palate is a sweetness along with a buffalo wing sauce flavor. 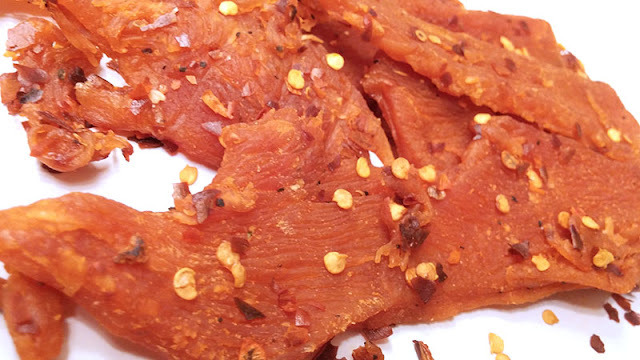 There's also a light red chile pepper flavor, and a light bit of heat. The chewing brings on more of the sweet buffalo wing sauce. For being labeled, "Buffalo Chicken Wing" and "Hot", it seems to hold up. It has the same flavor as the milder version that I reviewed last week, except with some red chile pepper flakes added. Basically, it's a heavily sweetened buffalo wing sauce, but without the spice and heat removed. Meanwhile, the red chile pepper flakes add the spice and heat back in. I wouldn't really call this, "hot", however. It ranks on my personal heat scale as "medium" (level 3 out of 5). 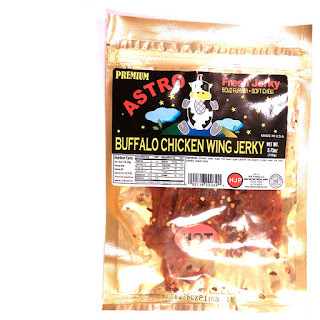 The primary taste profile is exactly that, just a heavily sweet buffalo wing sauce, spiced with red chile pepper flakes. 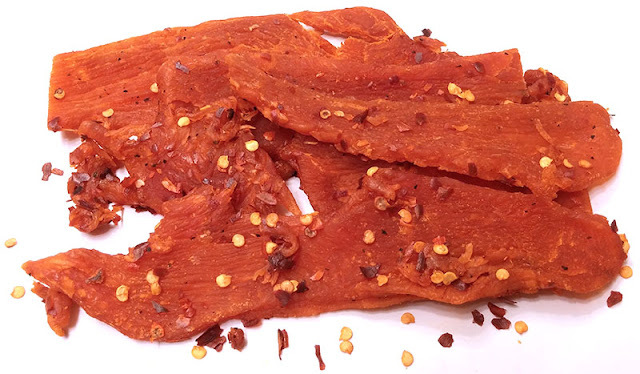 This Hot version of Buffalo Chicken Wing chicken jerky from Astro Fresh is pretty much the same jerky as the mild version I reviewed last week, but with red chile pepper flakes added. The flakes do add some additional flavor, and little bit of heat. But to reiterate, I don't find the heavily sweet buffalo wing sauce all that appetizing. I would prefer just a little bit of sweet, and perhaps something citrus, like lemon or orange. Otherwise, this tastes like a buffalo wing sauce that had its wings clipped, and then duct-taped by throwing in some red pepper flakes. The chicken meat often chews mushy, and doesn't quite evoke a fresh taste and feel.